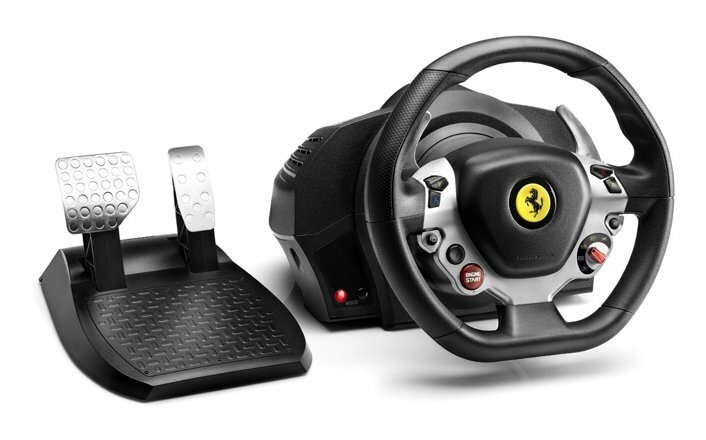 Welcome to my review of the Thrustmaster TX 458 Italia Racing wheel and pedal set. You may have seen our un-boxing video and some of the test drives we’ve done with it, but now it’s time to review this new offering from Thrustmaster. 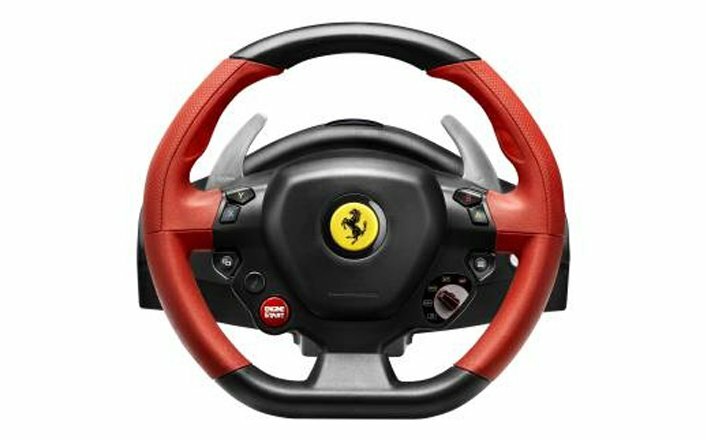 When we reviewed the Ferrari F430 wheel by Thrustmaster many years ago, our biggest complaint was it having only 270 degrees of rotation. It also lacked compatibility with the consoles. They did make it compatible with the PS3 eventually, but with limited support from game titles. 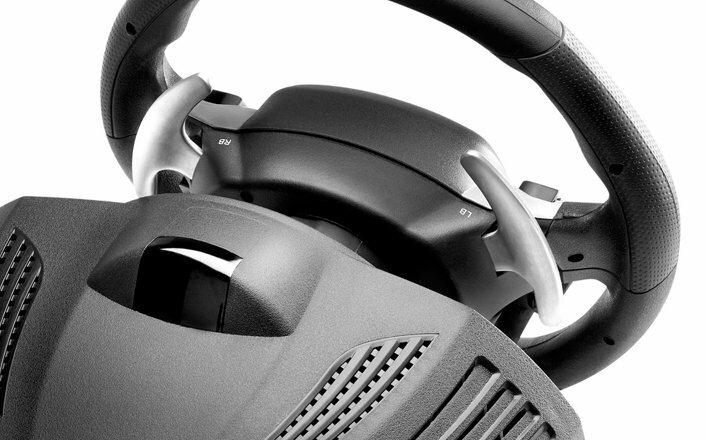 Then came the T500… The top of the line model in the Thrustmaster line up. 1080 degrees of rotation, a pedal set with a clutch, GT5 compatibility and a wheel that performed as well as ones priced much higher. Now comes the TX One and here’s some of the specs. 900 degrees of rotation, brushless force feedback motors, belt driven mechanism, Xbox one and PC compatibility. It’s a modular system that they refer to as Eco where you can use the add-on GTE and F1 rims that Thrusmaster made originally for the T500. 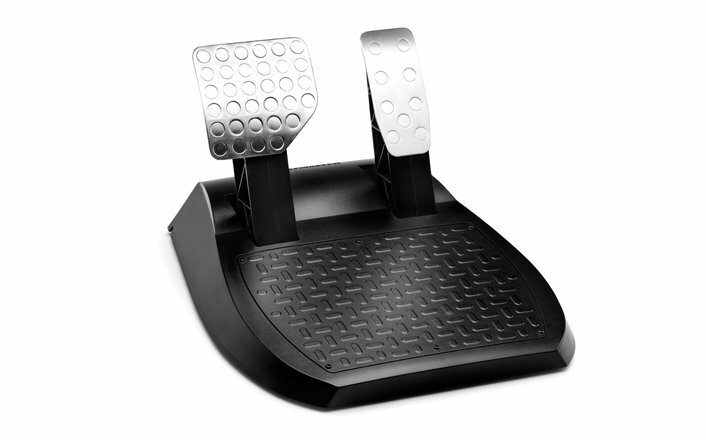 It comes with a two pedal set that is very similar to it’s older cousins, the F430. Matter of fact ,These are almost identical to the set that came with that package. So.. Does this wheel compare to the competition in its price range?? Is it as good as T500 ?? Hopefully you’ll know after checking out this review. How it feels on the PC – I’ve tried it with Assetto Corsa, Game StockCar 2013, iRacing and rFactor 2 and I honestly can’t tell the difference between it and the T500 once I have things dialed in when running the GTE or F1 rims. It seems you have to crank the force feedback up a tad more compared to the T500 if you want a heavy feel, but they really feel similar while driving. The only real difference is that the T500 may have a little more dampening than the TX. Less rolling or moving resistance is a good way to put it. I’d actually say the TX may be quicker turning than the T500. The base is smaller, which makes it easier to attach to a rig, wheel stand or desk. The lighter weight also puts less of a load on your sim chassis. On the console, obviously I’ve only tried it with Forza 5, but have to say, It’s probably the best sim racing experience I’ve had on the console. Great force feedback matched up with Forza 5’s new tire model actually makes it a better experience than some things I’ve tried on the PC recently. Doesn’t match up to iRacing or rFactor 2. But compared to say Sim Bins DTM Experience on the PC, I’d prefer to run Forza 5 with it. Comparing it to the Xbox 360 offerings and Forza 4.. There really is a huge gap from that driving experience to this one. So.. There’s some specs and opinion, now it’s time for some Pros and cons and to give you my final thoughts. 1028 Steps or bits of movement in the pedal set while attached to the wheel. Only compatible with Xbox One and PC – . Would have been great to use this on the PS3 as well, but that’s a licensing issue Im sure. Would like to see this base sold alone. No rim. Then you could buy add ons and keep it affordable, and get exactly what you want. Also would have liked to have at least seen a progressive brake for this price point. The pedals would bring the overall score of this package down. 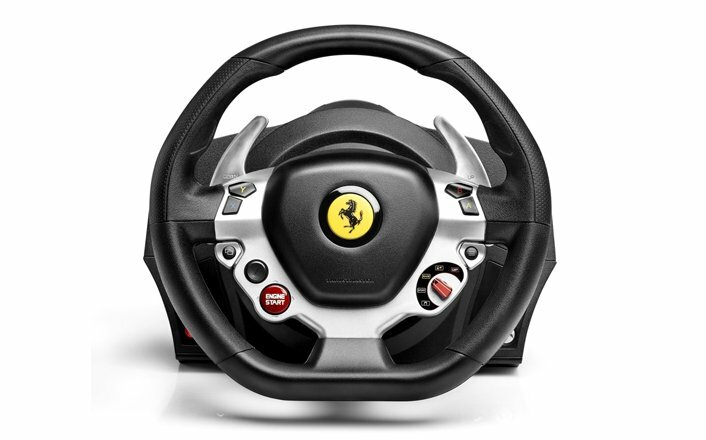 The wheel , with a GTE or F1 rim, would get close to a 10.. With the 458 stock wheel.. A 9.. The pedals.. Are maybe a 7 at best. No clutch, and no progressive brake. As a package, I’d give this an 8 since you can add on or upgrade it. With the T3PA pedals, I’d give it a solid 9. In closing, this is my wheel of choice right now. Smooth, precise force feedback, quick turning mechanism, smaller base. I love this wheel. I have it on my big racing rig and am using it on the Xbox One. That’s going to wrap things up, I hope you’ve enjoyed this review. Would love to hear your comments if you own one of these. This is definitely an entry level setup, but we recommend stepping it up and going with something that has force feedback.